If you’re planning to start a website, then you’re probably looking into the different options for web hosting. There are a number of articles on this that you can read online. However, most if not all of these articles will recommend an option called “shared hosting.” But what exactly is shared hosting? In this article, we’ll discuss the basics of shared hosting and how shared hosting differentiates itself from other web hosting options. By the end of the article, you should be able to have a thorough understanding of shared hosting and learn why it is considered by many to be the best web hosting option currently available. Web hosting is a service that provides website owners with a virtual space to store and access their data. Literally, every piece of information on the internet is stored on a server somewhere on the planet. Web hosts own and maintain these servers, incurring all the trouble and costs related thereto. However, there is a limit to how much data each server can store. Every bit of data occupies a piece of limited virtual space. This makes virtual space valuable. Thus, web hosting is often provided for free, so that web hosts can have enough money to maintain and upgrade their servers. In that sense, web hosting is very similar to renting out a piece of property. Website owners pay the web host to store their data on its servers. The website owner is the tenant; the website data is the tenant’s property; the web host is the landlord; the virtual space in the server is the leased property. Now that you know what web hosting is, let’s talk about shared hosting. There are a lot of choices when it comes to web hosting or getting your website online. The first option is self-hosting. This basically entails buying, maintaining, and operating as your own web host. While this gives you full control over the web hosting process, the sheer amount of resources involved in this option makes it less cost-effective than the ones that follow. The second option is dedicated hosting. In dedicated hosting, one particular server of the web host is “dedicated” to your data. In other words, you’ll be leasing out an entire server operated by a web host, so that you can enjoy exclusive rights to all the virtual space on that server. This option provides you with increased control over the web hosting process (more particularly, it improves the security of your data), but is still rather pricey when compared to the next option. Shared hosting enables numerous sites to use a sole server. More often than not, you’ll have no idea which sites you’re sharing a server with. Every user, however, will have a limit as to the amount of virtual space they can utilize. This limit depends on the web hosting package that user is subscribed to. The more expensive the subscription, the more data you can store. Some subscriptions even let users store an unlimited amount of data. Shared hosting is the least expensive and most practical choice for most website owners. In most cases, even if you subscribe to the most expensive web hosting package, it will probably still be cheaper than self-hosting or dedicated hosting. Site stacking speed is crucial to ensuring the accessibility of your website. People need data quick and most aren’t willing for your website to load. If you want to guarantee a stable site stacking speed, you should look for a web host that’s guaranteed to hold up against high traffic. Once you’ve found a reliable web host, you need to choose the right web hosting package. For new websites that don’t have much activity, even the most affordable subscriptions will have enough site stacking speed to keep up with the traffic. However, once your website starts to pick up momentum, you ought to consider scaling up to a better plan. On any website, accidents and overall downtime can likewise greatly affect traffic. These unfortunate incidents are usually caused by coding issues and even the best web hosting companies can’t ensure a 100% uptime. There’s no need to stress over it, however, as there’s a reliable method to mitigate potential damage. While picking a web hosting plan, you should to search for third-party reviews. Particularly, you’ll want to assess the web host’s reliability using tools like Host-Tracker. If the web host underperforms, then you can rapidly change to a different, more reliable web host. Each web host consists of a control panel or dashboard that allows the website owner or his staff to make changes to the website and/or troubleshoot technical issues. Unfortunately, some web hosts have control panels with an outdated interface and features. For web newbies, however, it is best to choose a web host with an easy-to-use control panel with updated features that are compatible with the latest tools, apps, and plugins. As an example, cPanel offers a streamlined interface that is easy enough for anyone to learn. It gives you full control of your databases, email records, documents, and app data, without stressing over coincidentally breaking anything. If you’re just starting out with your website, it’s common to have a few issues when it comes to the initial setup. As such, you may have a lot of questions and doubts that need addressing. This is exactly why you need to consider a quality web host. Keep in mind that dealing with a malfunctioning website can be incredibly taxing. Issues tend to emerge at the untimeliest occasions, so you need customer support that consistently satisfies your needs. To this end, we highly recommend a web host with 24/7 support or, at the very least, one which responds to questions within 24 hours. Owning a website requires hours and hours of composing content and advancing your posts on different channels. You also need to spend a significant sum of money for the right tools, apps, site optimization, and more if you really want your website to take off. Unfortunately, the more your website is worth, the more attractive it is for hackers. As such, you need the best possible security to keep your website functioning. While there are a lot of security options on the market, it is essential to pick a web host that goes far beyond the normal security offering. Keep in mind that you’re going to need a good amount of information about what your chosen host has to offer in terms of security. Settle on the best choice you’ve got to prevent any future online peril that could come your way. It’s always important to set expectations when it comes to paid services. In this particular instance, you need to fully understand the difference between your own duties and the duties of your web host. First off, let’s talk about the web host. The web host is in charge of all tasks related to server support. For example, the web host may update existing drivers, add new ones or even overhaul the entire existing framework, so as to improve everyone’s overall experience in the long run. On the other hand, you are in charge of your own website. You will need to track all the changes, add tools, plugins, and apps, introduce all the content, monitor your own email, and perform all other tasks related to the operation and maintenance of your website. Cost – Monthly charges are not as high as other web hosting options. Moreover, you can further decrease costs by subscribing to an annual subscription instead of a monthly one. Versatility – Most shared hosting options have an assortment of bundles. Even the smallest package may have a good number of perks and tools at the ready. In the alternative, you can also add stuff as you go. You can pick the base bundle and then redesign as your site develops. Features – Most web hosting options nowadays have a good number of inclusions that will suit pretty much everyone’s needs. Along with all this are a few good pieces of content that will prove to be useful to your site. Forums, web journals, podcasts, and more are some examples of content that might be incorporated into your hosting package. Before you choose to utilize shared hosting for your site, it is essential that you understand what you’re looking for and what issues to anticipate. This will allow you to make an educated decision if this is the right web hosting option for you to use for your site or even your blog. Shared hosting has a scope of favorable features that organizations and even common people can reap benefits from once they get a hold of it. 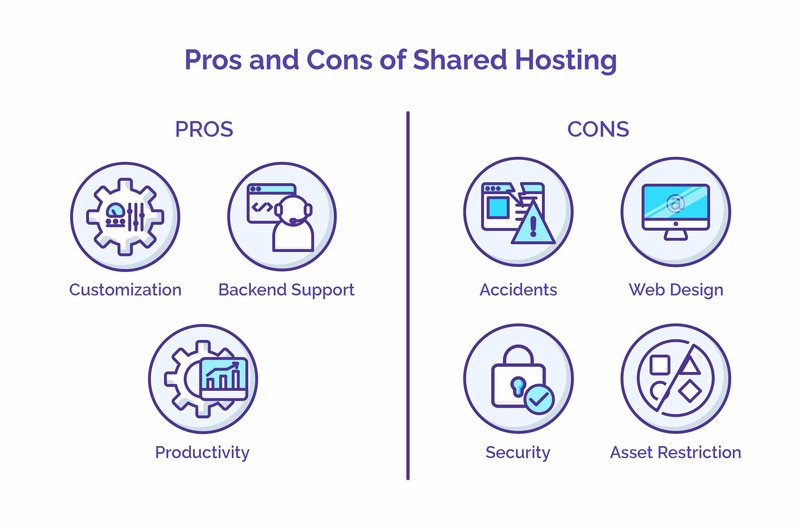 Now that we’ve discussed how shared hosting is superior to other web hosting options, let’s go into more detail regarding its pros and cons. The assets of your website are shared to visitors every time they check your site. However, these visitors will obviously not be able to change anything therein. To make changes to the website, your website admin needs to utilize the various functions of the control panel. If we liken your website to the human body, the site design and interface can be the skeleton, the content will be the tissues and organs, and the control panel will be the brain. The control panel controls all the other parts of your website and allows you to customize almost everything from the images displayed to the backend programming. Managing every little thing on your website is difficult and downright distracting. You need to free yourself of the need to micromanage if you’re going to look at the big picture and gain overall success. With shared hosting, your web hosting will be overseen by skilled technicians and specialists. This allows you to focus on more important things such as content management and search engine optimization. Shared hosting offers an easy and cost-effective way to share assets and information with other people. This does not only include website visitors, but also members of your team. For example, organizations who use their website for internal purposes can share data with everyone on their time in the blink of an eye. It also allows the organization to keep all their data storage and processing in one place. This is one of the things that you ought to address because it can happen frequently and just can’t be avoided. Even if you do get a decent web host, there have historically been instances wherein the shared hosting system broke down. Despite all preparations to guard against shared hosting issues, sharing digital space on a single server with numerous people clearly has the potential for disaster. Although this is admittedly an issue for all web hosting options, website design is very important whenever you’re allowing other people to access your website. For example, pages that are too long or navigation that is too complicated can easily turn off visitors. Moreover, since the internet is likely full of other websites based on the same topic as yours, it’s possible (or even likely) that they will simply try to look for the information they need on a competing website. Security could also be a concern. With online security issues on the rise, it is important to guarantee that your site is secure. Sadly, security is another frequently neglected issue in shared hosting. It just takes one of the administrators in the shared hosting platform to take advantage of the access they have, causing serious turmoil on the server. This could give hackers, among others, access to your information, especially if you’re not well-versed in programming lingo. Furthermore, in a worst-case scenario, your site could simply be blocked if the servers detect issues that affect your site as a whole. Fortunately, these things can be resolved or avoided by finding a dependable web hosting company that has the right tools and knowledge to deal with the said issues. Because everybody on the server must be considered with the end goal of keeping high uptime rates and to ensure the security of the server, a few applications, among other things, might be limited. You will most likely be unable to run specific applications that may need on your site. Generally speaking, shared hosting is appropriate for individuals who are simply starting out, such as personal bloggers, small businesses, and online shops. It’s the least expensive type of hosting in that you’re fundamentally sharing server space with a number of different users. This makes shared hosting very affordable, without sacrificing any of the functionality required to operate the website. In any case, it can be a rather critical decision in case you’re a first-time website admin and you don’t need something like VPS hosting or other additional features that require extensive technical knowledge. The trouble you’ll most likely encounter is that you’ll probably reach a time when shared hosting simply isn’t sufficient as strong and after that, you’ll have to move on to another type of hosting with more resources accessible to you. When it comes to who should utilize it, that for the most part goes to independent companies and certain bloggers, as previously mentioned. When your site begins to produce sufficient income or traffic, you’ll need to put more resources to upgrade into something more powerful. Are There Alternatives to Shared Hosting? While there are so-called “upgrades” to shared hosting plans, it may as well be wrong to assume there are alternatives in the strictest sense of the word. For the sake of discussion, however, let’s consider a few platforms offering shared hosting subscriptions as alternatives. With that said, the alternatives to shared hosting include WordPress, VPS hosting options, and a few other less noteworthy options. In the long run, all of these will prove to be more expensive than a basic shared hosting plan, but they will provide you with greater levels of customization and maintenance. Shared hosting, nevertheless, will most likely be the best option for website owners who are just starting out, especially those whose sites don’t receive a lot of traffic. Whenever your business, blog, or website grows, you can always move on to something akin to VPN hosting or something newer, such as cloud hosting, which we will discuss a bit. Nowadays, aside from shared hosting, we also have the option of cloud hosting. Unfortunately, not a lot of people know about cloud hosting, so it’s worth touching on a bit so you can understand how it works, especially since it could spell significant changes in the future. Despite the fact that shared and cloud web hosting can be two significantly different things, the two terms are often used interchangeably and are equally popular among tech-savvy website owners. As a rule, web hosting involves leasing space on a particular web host’s server. The difference between cloud hosting and shared hosting lies in the where the data is stored. One stores data in a single server, while the other stores data in a system of different servers. Cloud hosting involves linking several servers to share resources so that they can collectively handle data for various websites. Since each server can be optimized to perform several tasks, the process can be streamlined to improve both speed and the effective use of server assets. More servers can even be added to account for downtime, breakdowns, and other unfortunate accidents. Cloud hosting, in any case, adopts an alternate strategy: numerous servers pool their assets together and coordinate. The additional equipment implies more assets are accessible to each client. Finally, instead of shared hosting’s more convenient features, cloud hosting plans normally include a specialized control panel, redesigned equipment, and web admins to deal with the everyday support task and unforeseen issues. How Are Shared Hosting and Cloud Hosting Different? The main difference between shared hosting and cloud hosting is the capacity to add and subtract resources and server assets to deal with changes in website traffic. With shared hosting, suppliers distribute a specific measure and capacity, as obtaining more assets requires moving up to a higher-level shared hosting bundle or another platform altogether. To do away with the need to upgrade shared hosting plans, some web hosts offer unlimited plans. An unlimited plan entails giving the website owner unlimited server assets in terms of capacity, transfer speed, databases, and email accounts. However, despite the obvious benefits of getting an unlimited plan, most web hosts normally request you to use the plan inside specific parameters so that you don’t affect other clients on the server. Websites that surpass the distributed resource utilization are usually punished with fees or other penalties. On the other hand, adaptability is cloud hosting’s greatest feature. With such massive numbers of servers on backup, your website’s needs can be balanced on a whim. Cloud services usually have a feature which allows website owners to filter their use and scale up or down as required. Here are a few other things that are beneficial for those utilizing cloud hosting services and how it stands up to shared hosting. Hosts guarantee a specific level of accessibility or time when your site is completely operational and open on the web. Shared hosting users will often be guaranteed the standard 99.9% uptime. On the remote possibility that the supplier can’t give the rates as guaranteed, the web host will provide clients a discount off a part of their bill. Cloud hosting ordinarily comes with a more reliable uptime since it utilizes more servers. Website owners need a web host that can quickly and easily respond to their concerns. While the website might not break immediately, there will certainly be occasional issues down the road. Fortunately, shared hosting providers often give nonstop help through email tickets, live talk, and telephone calls. In comparison, cloud hosting support tends to be a little less involved but are rather more focused on overseeing the big picture to prevent such issues from happening in the first place. What good would any server be if you can’t implement projects that you expect to drive long-term growth? Quality shared hosting providers will offer several programming platforms and features to cover your requirements for frameworks, blog stages, wikis, webmail bundles, forums, and eCommerce stores. The contents are less basic in cloud hosting, as clients are usually more tech-savvy and have the necessary know-how to introduce the applications. With that said, however, some cloud hosting providers also provide easy-to-use features to appeal to a more varied clientele. Is Shared Hosting Good for Your Business? As what you’ve read, you’re probably already familiar with what shared hosting is for and who can benefit from it. But let’s say you have a business and you’re looking for a more cost-effective way of getting a website out there. Would shared hosting be a viable choice? Well, there’s really no specific answer. However, there are a few points to consider if you’re looking to use shared hosting for your company or organization. Imagine running into trouble with your web expert. Or consider perhaps the possibility that they’re not satisfied with how much you’re paying them and then they attempt to charge you an exorbitant amount to get your site moving. You should always keep yourself and your web expert on a common ground to prevent problems. You also ought to have a good degree of control of your web host. Whenever you run into problems with your web expert, then you can always resolve the issue yourself. Most entrepreneurs wanting to establish an online presence tend to run into the trouble of developing a business and yet running into problems with web hosting platforms for a number of reasons. Bigger and better-known companies do offer the best amount of technical support out there, always willing to prepare you for cyber attacks, buy the newest innovation, and offer the most dependable management at a reasonable rate. Smaller organizations, though cheaper and perhaps easier to reach out to (whether that be a good thing or a bad thing for you may not have enough assets to fulfill your needs. You don’t necessarily need to go for the biggest web hosting companies out there, just ones that are reputable enough. Fortunately, you’ve got a vast array of choices at your disposal, so you won’t need to look far. Servers tend to be intimidating for a lot of business owners. If you’re a business owner yourself, you obviously need to have a good server to further accommodate your needs online, especially if you need to get your website up. A well-managed server is just that: a server that features both virtualization and human administration to keep everything running as you wish. With an unmanaged server, the main draw that you get is an assurance that the server will work. You even have the option or perhaps the obligation introduces the majority of your own server programming for the most part. If you’re looking to introduce things and languages such as Apache, Ubuntu, MySQL, then you’re in luck with something unmanaged. Otherwise, you a server that’ll allow you to see to such aspect. If you’re wondering who on earth would want an unmanaged server, that would be anyone who has someone who’s readily available for when you need to input things into the server. For the most part, unmanaged servers are better-performing and more cost-effective, and a good number of businesses tend to go for that route. When Would It Be Time to Move on from Shared Hosting? Shared hosting is economical, however, there’s a reason it costs pretty much nothing. The “common” in shared hosting implies that heaps of websites live on that particular server. The capacity, memory, and speed of that server are shared by all websites in it. A typical web host operates numerous servers. In turn, each of these servers is estimated to be able to store data for several thousand websites. With that said, however, web hosts typically lease the virtual space on a particular server to more websites than what it could technically accommodate. While there is a definite danger of overloading the server if a large number of websites simultaneously utilize server assets, it is more likely that a large percentage of the websites on the server are actually defunct or underutilized. This is why web hosts are practically able to over-lease the virtual space on their servers. In the process, web hosts maximize profit and are able to make the service so affordable. This setup is ideal for websites that are just starting out and have very few visitors. On the other hand, when a website relies upon its web host to provide quick and reliable access to its data, the setup can be troublesome. Shared hosting users may also experience technical issues, especially when everybody is competing for similar assets. Moreover, when one of the users on a particular server experiences technical issues, there’s also a possibility that such an issue may infect other portions of the server, effectively corrupting the entire server. The frequency and severity of these issues is usually dependent on the reliability of the web host. Generally speaking, price often reflects quality when it comes to web hosting simply because the additional income generated by the web host will likely go into upgrading the servers and related tasks. Another issue with shared hosting controls. Unlike self-hosting or dedicated hosting, wherein you are basically provided free reign over the server, you relinquish control over the hardware and other administrative aspects of the server in shared hosting. Hence, the quality of shared hosting often depends on the overall skill of the web host and its admins. When you become an even more experienced website owner, such can be an unwelcome necessity. If you feel that shared hosting isn’t giving you the degree of control you require, then you better start thinking of dedicated hosting or self-hosting. Finally, if you really want the cheapest option, you call also go with unmanaged shared hosting. As the name implies, the web host shares its assets with you. However, for server and site administration, you’re all on your own. Unless you have a high degree of technical knowledge, however, this option is not recommended. Much has been said about shared hosting, but it’s always good to know of a few interesting facts that’ll help you decide on whether or not shared hosting is for you. When settling on a choice about a hosting plant, don’t automatically go for a dedicated server simply because you want more options or don’t want to share server assets. If you don’t really need the additional control and assets in dedicated hosting, it may be pointless in the long run and you may simply be wasting money subscribing for something you don’t really need. Shared hosting may well be a perfect choice, especially if you’re just starting out. After all, if your website does pickup, the subscription can be effortlessly upgraded whenever you need to or when you feel like it. For the long term, the actual concern for most site owners is the amount of cash that they’ve spent in proportion to the income generated. In this light, shared hosting is perhaps the perfect and the easiest choice for bloggers, small and medium enterprises, individual sites, and others similarly situated people or entities.